I asked around and even conducted a survey looking for suggestions for great places to take the kids out to eat. I’m putting the results of this into a series of posts. 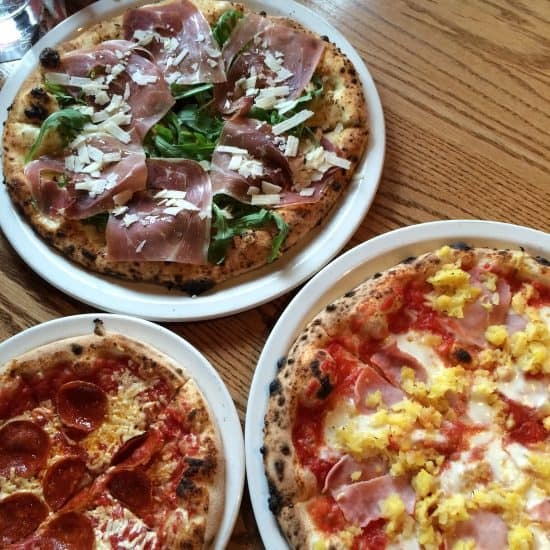 Great pizza restaurants is the first installment. This isn’t a definitive list but it has some great options with a large range of prices and styles. 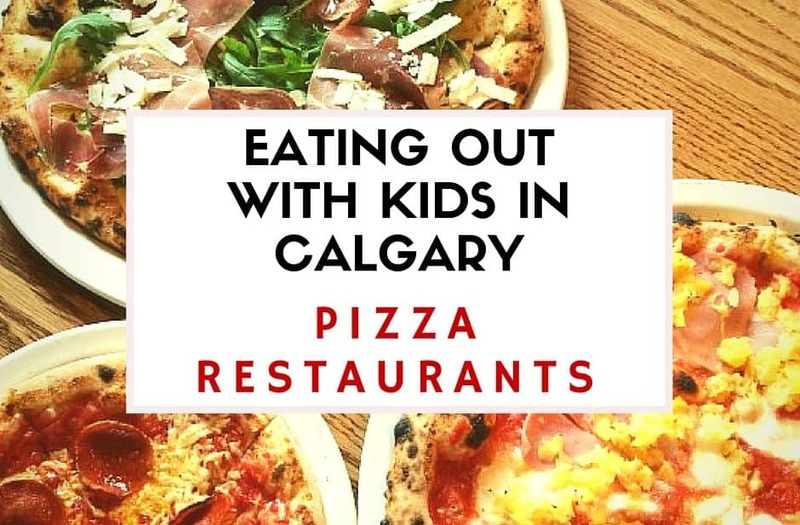 I’ve split the list up into two sections – the first lists family-friendly restaurants and the second lists restaurants where you can get great pizza and take the kids but are aimed more at adults. What’s your favorite pizza restaurant to take the kids to? Is there another restaurant you think should be on this list? Famoso was by far most recommended pizza restaurant for kids. Famoso’s is a Canadian chain with four locations in Calgary as well as more in Alberta, Saskatchewan, Ontario and BC. Famoso’s serves Neapolitan style thin crust pizza. It cooks quickly so you usually don’t have to wait too long for your food. While you are waiting you can get coloring or pizza dough to for the kids to play with. 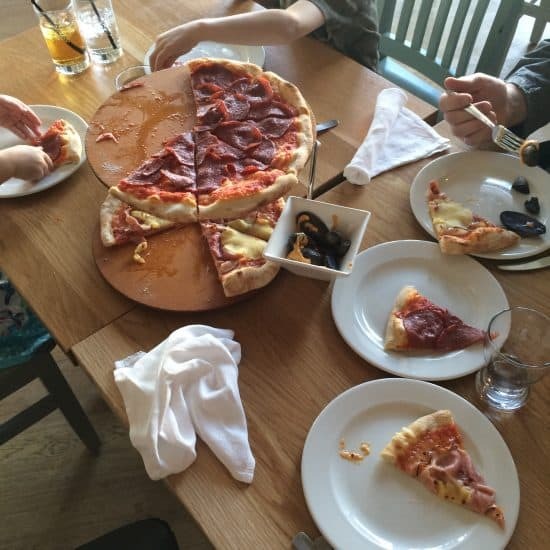 When you dine-in they have a kids’ special which comes with a kid sized pizza (as well as a few other entrée options), a drink and a scoop of Fiasco gelato or sorbetto. Did I mention they have Fisaco gelato and sorbetto? 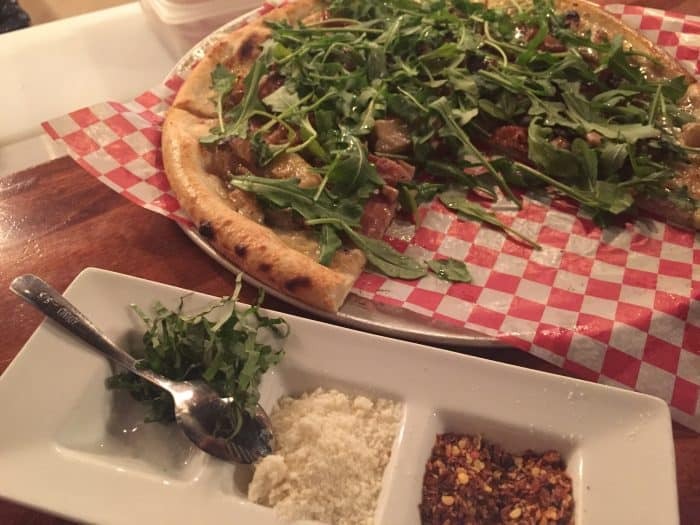 The pizza is excellent and the atmosphere is nice but very family friendly. Boston Pizza is a Canadian based chain with multiple locations in Calgary, across Canada, in the US and Mexico. They offer regular and thin crust pizza. Boston pizza is a super popular place to take kids and it is easy to say why. They have a great kids menu with lots of options, kid cups and coloring for while you wait. The atmosphere is very family-friendly and you don’t have to worry if your kids are acting like kids. Service is typically fast so you don’t have to wait a long time. Pizza and Steakhouse – Matador bills itself as a family restaurant so you know, you and your kids will be welcomed. Matador has been around since 1976 and uses local ingredients and homemade recipes. It’s not fancy and a bit old school but they have a kids menu with a lot of options and good thick crust pizza loaded with toppings. Blaze is a US chain that has recently opened it’s first location in Calgary. 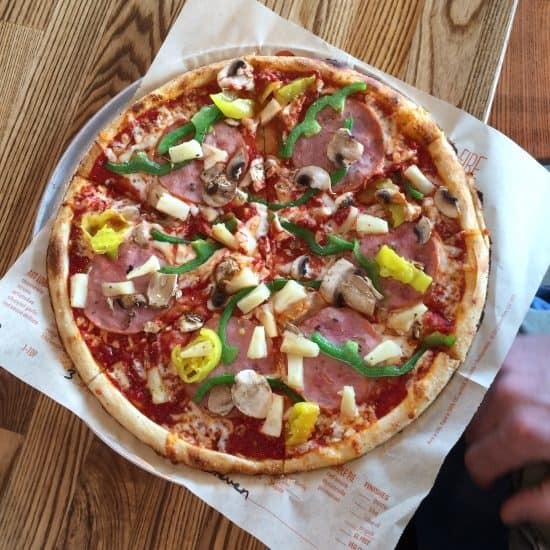 Blaze pizza is quick service pizza at its very best. They serve thin crust pizza that cooks quickly so even though it’s made to order you barely have to wait before its ready. You can even skip the line by pre-ordering online. Nick’s Steakhouse is a family run Calgary original – founded in 1979 by Nick Petros. Nick’s has a retro feel but the quality of their food is excellent. They are very family-friendly and welcoming to kids. They serve classic thick crust pizza piled high with toppings. They also have a kids menu. Coco Brooks is a Calgary based company, founded in 1999. You may be familiar with them from their frozen pizzas that are popular fundraisers but they also have three dine-in locations. They are very casual and family-friendly. They serve personal sized, thin crust, thick crust and gluten-free crust pizzas. They also have a kids menu which is a bit lighter on the toppings. 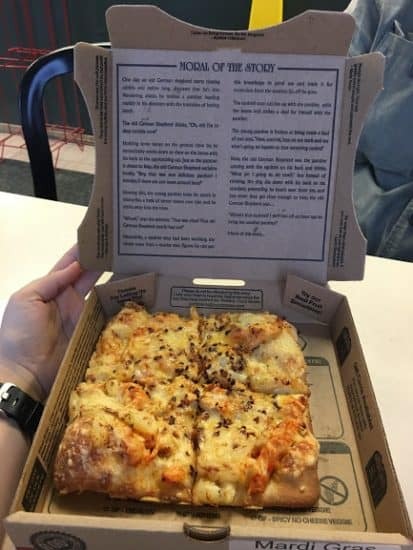 The pizzas are pre-made so you don’t have to wait a long time to get your pizzas. Without Papers is a ‘grownup’ restaurant that is also accommodating to kids. They make Italian style thin crust pizza. The menu is definitely geared towards adults and there are no kids’ menu. They do however have highchairs that attach to the tables and booster seats. They often have movies playing on the wall and you can ask for dough for the kids to play with too. The open kitchen makes it so you can watch as your pizza is made which can be pretty entertaining. They also make their own ice cream! Double Zero serves Neapolitan thin crust pizza. The restaurant and menu are geared towards adults but they have high chairs and you can easily order a pepperoni or cheese pizza. Even though it’s a pub, kids are welcome at LVD Pizza Bar until the early evening. LVD Pizza serves traditional Italian Pizza and is related and named after La Dolce Vita which is located just downstairs. The setting is fairly casual but the menu and restaurant are geared towards adults. PZA Parlour serves up Italian food with a modern twist. If you like out of the ordinary pizza options, you will love PZA but they also have more traditional choices as well. They also have a kids menu offering pasta, pizza or pizza pops. You forgot 4th spot kitchen & bar. 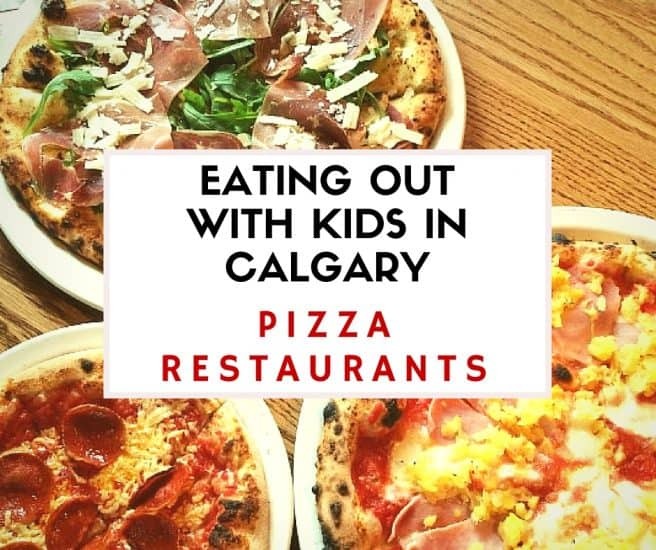 They do a great job catering to kids & have the best pizza in the city in my mind. Check out Ripe Tomato Pizza – great Neapolitan style pizzas in a fast casual setting. It gets better, on Tuesday’s kids eat free – my kids cant get enough. Olive Grove Midcap ore half price eat in Mondays!